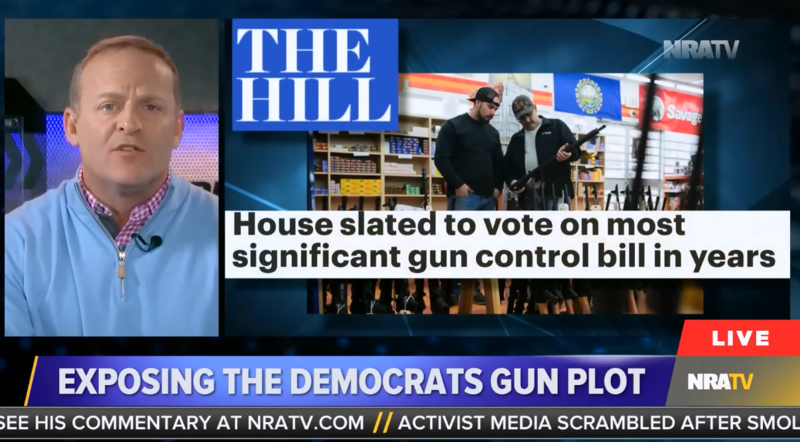 During his February 27 broadcast, NRATV host Grant Stinchfield spewed falsehoods about the new bill, claiming it could cause gun purchasers to “wait up to 10 days” for a firearm. In fact, the bill does not include a waiting period, and the National Instant Criminal Background Check System typically completes  background checks for gun sales within a few minutes. Stinchfield also falsely claimed that HR 8 would make “felons out of good, hard-working Americans because they made a mistake,” echoing the tired  and false NRA talking point  that background check bills seek to criminalize routine and obviously noncriminal  gun use. Among other misleading claims, Stinchfield questioned the constitutionality of requiring background checks for gun sales -- even though there is no serious legal debate  over the constitutionality of such provisions -- and claimed that family members will have to “jump through hoops” to transfer firearms among themselves, even though the bill explicitly exempts  many intrafamily transfers. Requiring a background check for a gun sale is a deterrent for felons and other individuals who are prohibited by law from owning firearms. Even with the existing “private sale” loophole, the federal background check system has stopped  more than 2.1 million prohibited sales since it was created in 1994. According to research highlighted by The Trace, a nonprofit media outlet that tracks U.S. gun violence, stronger background checks deter prohibited people by increasing the obstacles involved in obtaining a firearm. In a 2015 article, the outlet noted several states saw a drop  in the number of prohibited persons applying to buy a firearm after the original background check system was created. There is no evidence to support Stinchfield’s claim that this bill will prevent the “tens of thousands of” uncounted defensive gun uses every year. The consensus  among gun violence researchers is that firearms are used more often to commit crimes than to prevent them. In fact, defensive gun use is so rare  that it’s difficult to measure. Researchers have instead conducted surveys asking respondents about different types of gun uses, and the results demonstrate that criminal gun uses far outpace  defensive uses. The NRA is claiming that expanding background checks on firearms sales will place a “huge burden” on gun owners. But even gun owners don’t seem to agree with this assessment; the vast majority  of people who own firearms support requiring a background check for all sales.